This card was made for the CAS Challenge at CASology using the cue Hope. 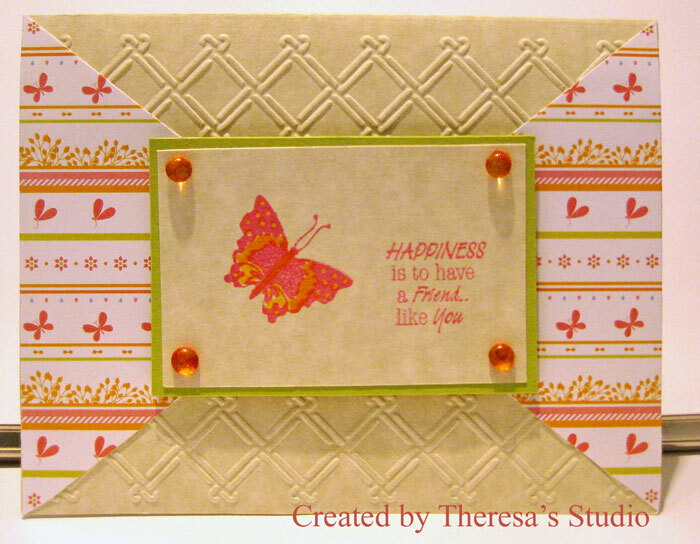 I debated whether it is too much for CAS but I am going to go with it anyway.....as I thought of this stamp and sentiment when I first read the challenge....just may have gone with too much patter paper but maybe I still have enough solid space. 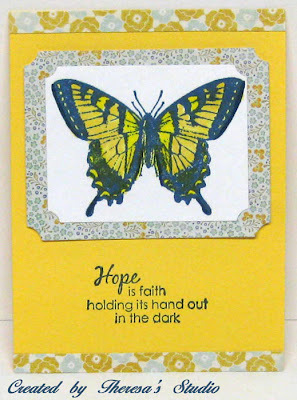 Flutter By Wednesday: Use blue, green, and yellow with Butterfly. Happy Easter to all my friends and followers! You must use something sold at Joan's Gardens on your card. I started by making a basket with strips of textured brown card stock that I have saved forever from making some other baskets. I started with a base card of textured olive green (stash) and layered with blue card stock embossed with Cuttlebug Wicker Weave Embossing Folder and the a pattern paper from My Mind's Eye pad. Does that not look like a lace tablecloth over a gold liner?? I then filled my basket with flowers and foliage. I first added a Fanciful Flourish cut with Cheery Lynn die but it got lost under the flowers. My flowers were made with Cheery Lynn Build a Flower #1 (stamens and leaves) and Build a Flower #2 ( poppy petals and leaves), Stampin' Up 6 petal flower punch, and Martha Stewart leaf punch. 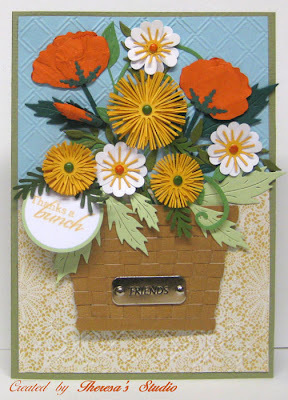 I used various shades of green paper for the leaves, yellow, orange, and white papers for the flowers. Green and orange brads were used in center of some of the flowers. A tag stamped with sentiment from Flourishes "Zinnias" in Memento Cantaloupe ink was added to the bouquet and a "Friends" Metal Brad (Stash) was attached to the baskets with brads....love the texture that adds. I used the Tool Kit from Joan's for assembling the flowers and some of the many useful tips from Selma for making flowers. Items used from Joan's are highlighted in orange. 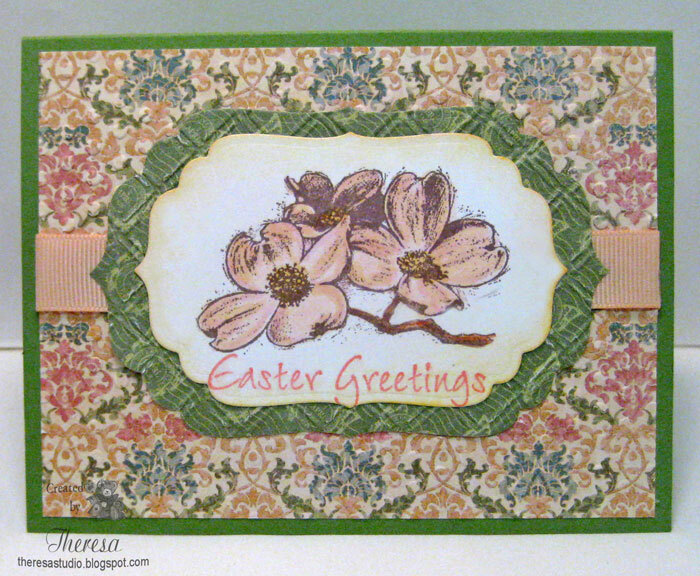 I made this card for a few challenges about to end....Using a sketch from Sweet Sunday and a stamp from Mark's Finest Papers Daffodil Greetings, I used some leftover Easter paper to create an Easter card. 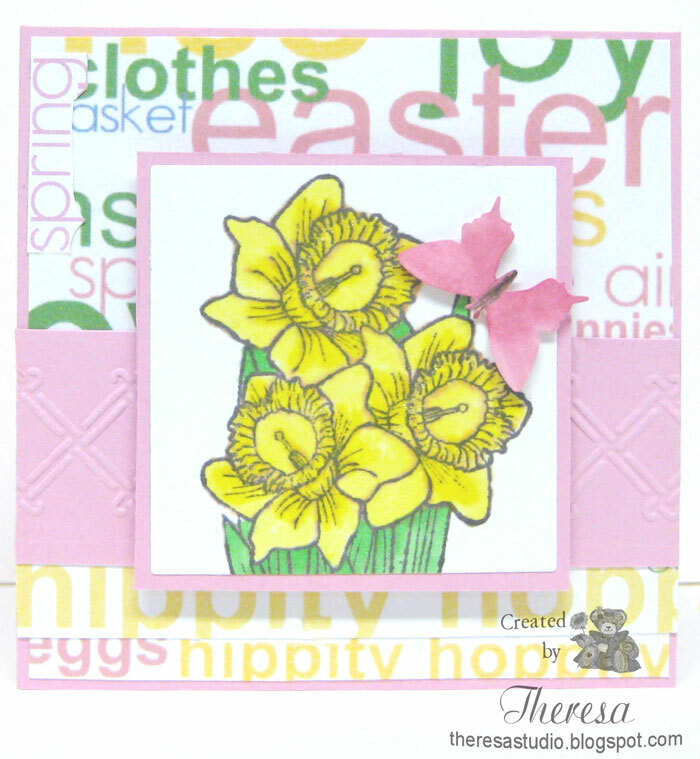 I stamped the daffodil image and colored with Copics on white cs and shine with some clear star and punch cut butterfly in pink. Following the sketch I arranged papers and words from paper adding some dry embossing and matting. 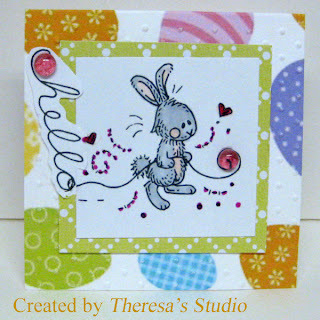 Speedy Fox and Friends Challenge: Make an Easter card or card with Bunny. Did an Easter card. 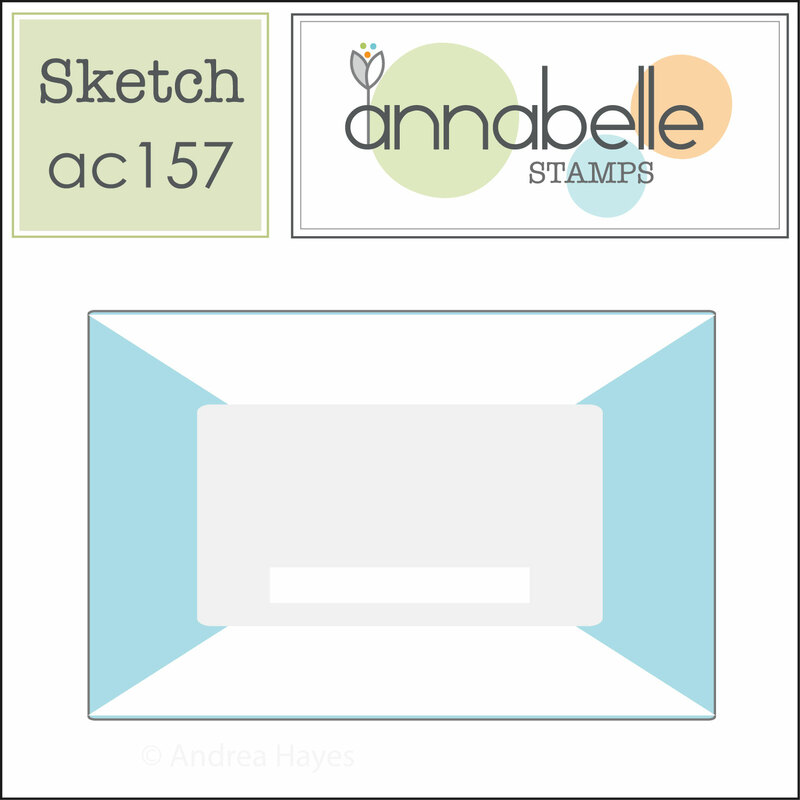 This is a card that I made for the Annabelle Sketch challenge shown on the left. When I saw this floral stamp from Annabelle's Floral Silhouette Set, I thought of this pattern Paper from My Mind's Eye Lost and Found pad and decided to use both together coloring the flowers similar to the paper using Memento Cottage Ivy ink and Copics RV17 and RV19 with Sukura Clear Star pen. I cut an opening in the pattern paper and placed the image under the window. Added the sentiment from Annabelle's Squared Posies and finished with some dew drops changing a bit from the sketch. 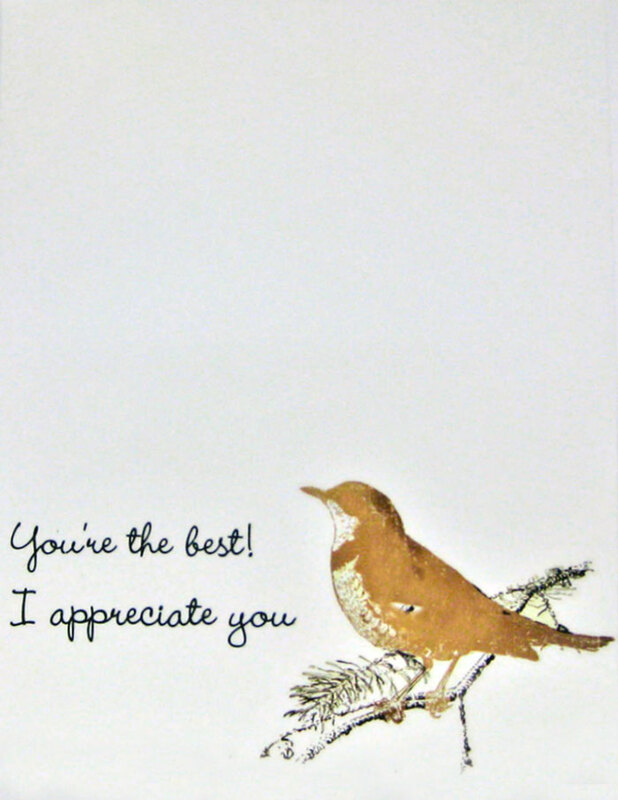 I made this card using a bird sticker from My Mind's Eye pack and sentiments from a Sticker Pack from Karen Foster. I looked every where for some stickers I have from SRM stickers but could not find...I decided to do this or miss the deadline. This week's theme for Meljens Challenge it to make a itty bitty teeny weeny notecard sized 3"x3"...I decided to make this notecard with a Meljen digi image that was too small for my original use so I was glad to find it to use along with some small scraps along with copics, a glaze pen, and some dew drops and made this cute Easter notecard. 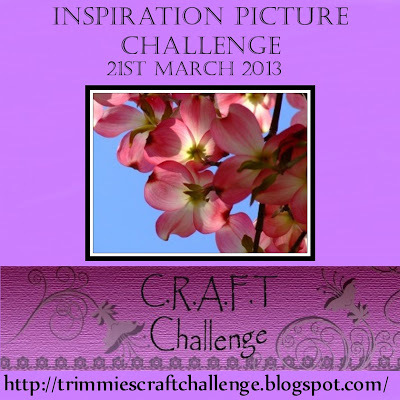 For the month of March Craft the Scene's challenge theme is Tropical Shores-to show things like palm trees, beaches and a bit of water. I used a lot of stamps for my scene including Flourishes' Palm trees with hammock from Beach Life, Seaside Stamping Ink's sand dunes hills, Alextamping's fence, ship and water reflections and ripples, and GKD birds. I used inks Memento Rich Cocoa, Summer Sky, Bahama Blue, Toffee Crunch, Grey Flannel: Brilliance Moonlight White (for sails); Copics E00,E15,E30, E34, E35, E50, YG67, B24, YR09, and Memento Markers Green Bamboo and Tuxedo Black, and some pencils for highlighting. Used brown brads on the trees for coconuts. 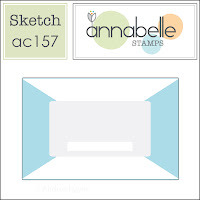 I used Oval scallop Nesties die to create clouds in the sky. Used number of techniques including sponging, masking, coloring, and blending to get the look that I wanted. I used a gold card base and mat of bright blue mat under the scene. 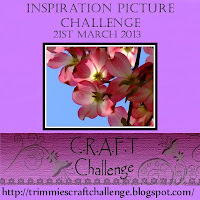 I spent 6 weeks on the tropical Island of Captiva recently which was great inspiration for this challenge. Cupcake Craft Challenges: Cool Men-make a card for a male using cool colours: blue, green, grey etc. Today , I am showing a card that I made for the What IF? 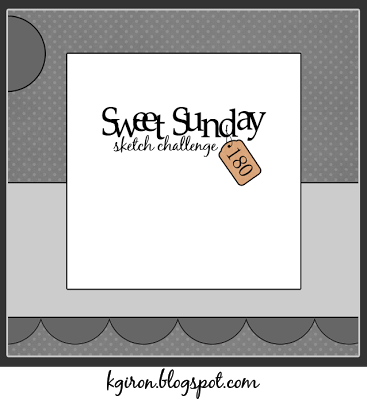 Wednesday Sketch challenge at The House That Stamps Built . 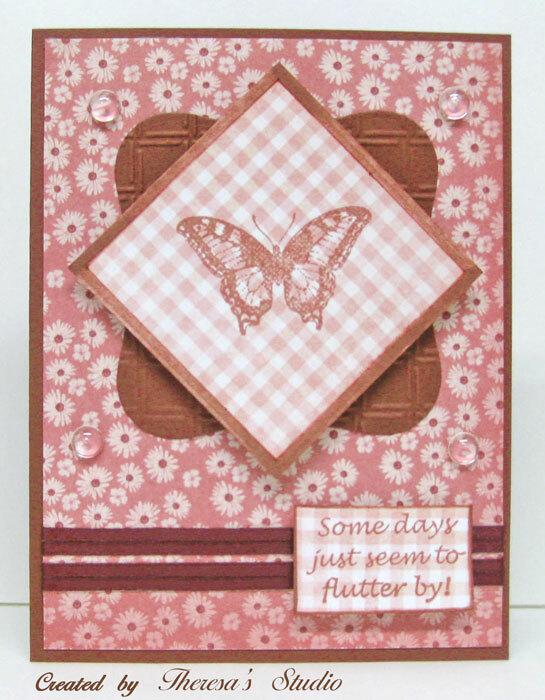 I used a Butterfly and Sentiment stamps from Repeat Impresssions....the card turned out to be a monochrome just by accident. I took my inspiration from the DP nad color. Welcome! 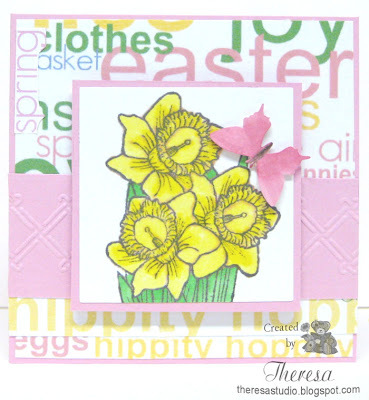 Another Easter greetings card with Spring Flowers. This is a Dogwood Blossom Stamp by Inkadinkado that I purchased a couple years ago because I liked it but have never inked it. I pulled out some new Graphics 45 paper and made this card. Stamped the Dogwood on white CS with Memento Rich Cocoa and colored with Copics, cut with Nestabilities Die,stamped with sentiment., and sponged with Distress ink. Placed this on a green DP Mat embossed with CB Wickerweave. 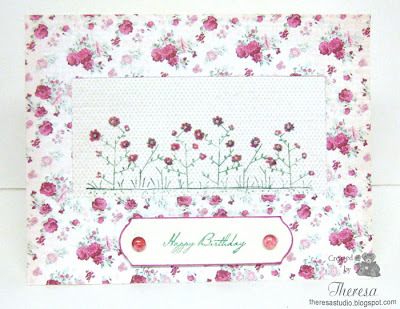 Placed over ribbon on a Floral Mat embossed with a CB EF. Attached to a green card base. Love the colors. Timeless Tuesday: 212-Bring on spring. Welcome. I have been taking some time off from blogging. 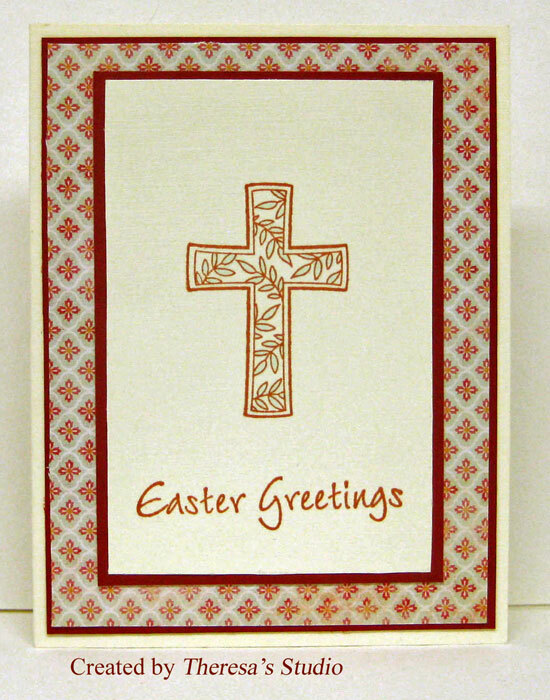 I am easing back into card making with some Easter cards. This is a clean and simple design made with some very old stamps that I have had for several years and DP from My Mind's Eye. 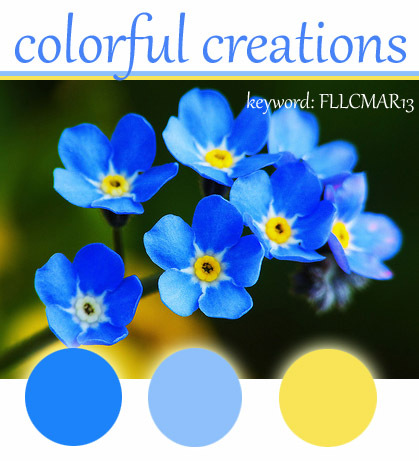 I chose colors from the DP which are not traditional colors that I used for Easter designs. I did not use any embellishments. Oldie But A Goodie: Theme is Easter-rubber stamps are several years old. To join in Flourishes' March Release challenge, I was inspired by the beautiful color palette above! I stamped an image from Flourishes Cherry Blossoms and one of their sentiments and came up with the card below. 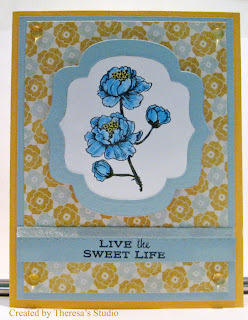 I used some Pattern Paper from My Mind's Eye and solid white, yellow, and blue card stock from stash. Finished with blue looped ribbon and some yellow dew drops. Hello! 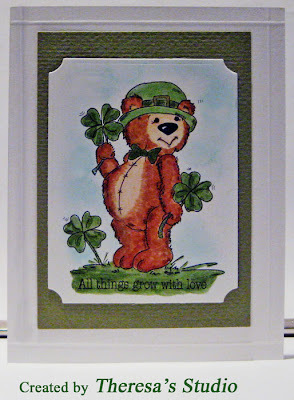 This is another card that I made with the digi bear shown on my banner. He is from Sassy Cheryl. I colored him with Copics and sponged the sky with Memento Blue. I simply cut with Nesties Die and placed on a green textured mat and on a scored white card stock base. 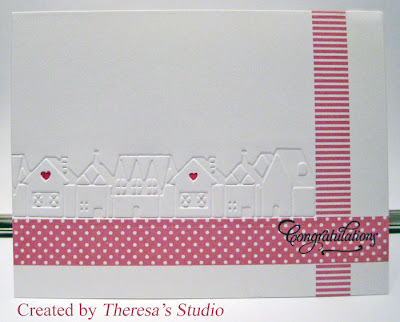 Stamped sentiment from Annabelle Stamp in black ink. Simon Says: A bit 'o' green. Welcome! 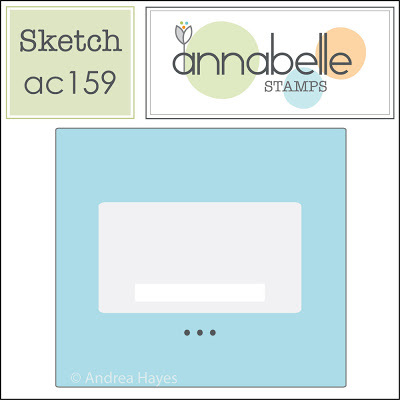 Today I am showing a one layer card made with stripes and dots that I printed from some digital paper files from Annabelle Stamps. I simply printed a portion of the paper designs on the precut white card stock and embossed with the Cuttlebug EF Village Border showing the reverse of the border. 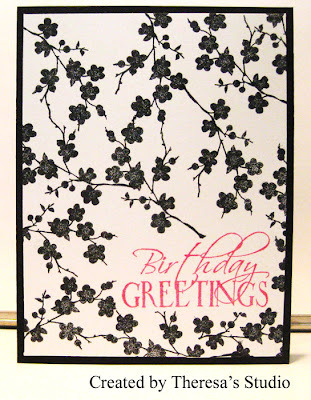 I stamped a Flourishes stamp in Memento Tuxedo Black. I have been making a lot of CAS cards lately. This card was made for a challenge at Cas-ual Friday: CFC92-Stamp your own background on your CAS creation. 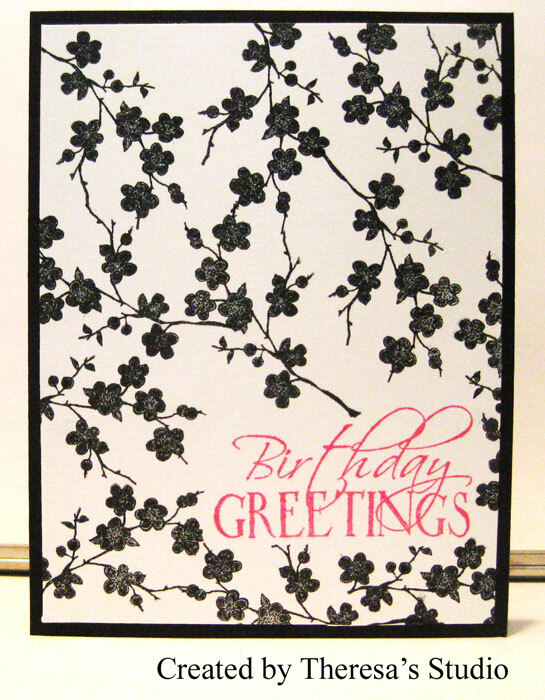 I used a stamp from Flourishes Cherry Blossoms to stamp 13 images on white card stock with Memento Tuxedo Black ink to create the background and stamped the sentiment from MFP's Papers with Memento Rose Bud ink. 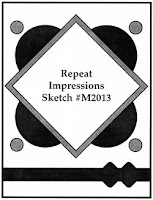 I adhered this to a card base of black card stock. This was a very quick and clean card. CAS-ual Friday: CFC92 make your own background by stamping. Hello! It has been a few days since I have made a card. 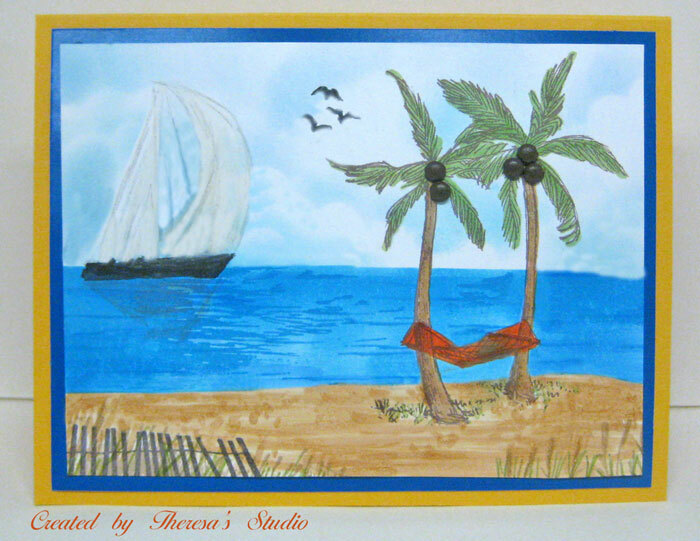 I have been busy posting to my Captiva Island Blog "Captiva Days with Al and Theresa" about our visit there. But today I took time to make a card for a few challenges.